Watch: Prayers and songs as thousands attend early morning prayers at Western Wall on Hoshana Rabbah. Hoshana Rabbah - What is it About? It’s the unknown quantity of the Jewish calendar as far as most Jews are concerned. It brings no massive crowds to the synagogue although it fills the Western Wall , but hardly anybody non-Orthodox has ever even heard of it. It always falls on a weekday and no-one has time to savour its ceremonial and liturgical poetry. 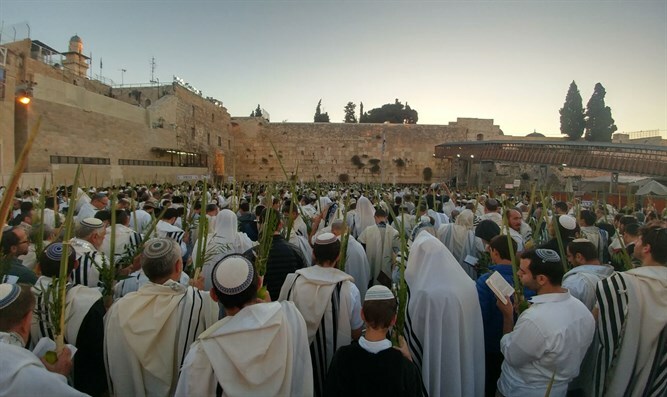 It is a solemn day with almost a Yom Kippur spirit and yet it is part of the joyous festival of Sukkot. This is Hoshana Rabbah, the seventh day of Sukkot. You know it is Sukkot because we sit in the sukkah, there is Hallel with lulav and etrog, and there is a circuit of the synagogue with worshippers holding lulav and etrog in their hands. But many of the prayers are solemn, the melodies recall Yom Kippur, and it is seen as a day for repentance. The name Hoshana Rabbah is not Biblical; Num. 29:32 refers simply to “the 7th day”. Hoshana Rabbah means either “the great Hoshana“; hoshana is a prayer for salvation, based on two words, hosha na, “please save”. The term hoshana is also applied to the bundles of willow twigs which are beaten until the leaves fall off; an early name for the festival was yom sh’vi’i shel aravah – “the 7th day of the willow”. The link with willows is suggested by the prayers for rain said on Sukkot. Willows need adequate water, and according to the Mishnah this is the time of year when the Almighty decides whether the coming year will have enough rain. There is a belief that God told Abraham that if his descendants are not forgiven on Rosh Hashanah, they will be forgiven on Yom Kippur; if they are not forgiven on Yom Kippur they will be forgiven on Hoshana Rabbah. This makes the 7th day of Sukkot our final chance of forgiveness during the month of Tishri. The Jerusalem Talmud (Rosh HaShanah 4:8) commenting on Isa. 58:2 (“They seek Me day by day”), says there are two days when people seek God – Rosh HaShanah and Hoshana Rabbah. There was a folk belief that on Hoshana Rabbah there is no shadow to the head of a person who is going to die during that year, and hence some people used to check their shadow that night to see whether it is still normal size. A more rationalistic belief is that Hoshana Rabbah is the messianic dimension of Sukkot. There is even a tradition that on this day we can actually hear the messianic footsteps. Making Hoshana Rabbah a solemn day of forgiveness was therefore the rabbis’ way of teaching us that the tikkun olam, the “mending of the world” that is part of messianism, has to begin with a personal act of spiritual mending.